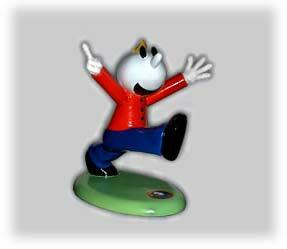 GUSTY© figurine; photo from the Official Don Woods Website (all rights reserved; used by permission). In 1954 Don Woods and Gusty® joined KTUL TV in Tulsa, Oklahoma for 35 memorable years of weather forecasts. During each weathercast Don drew a Gusty® showing the predicted weather conditions. The popularity of Don and Gusty® grew throughout portions of Oklahoma, Arkansas, and Kansas until they were household names. Don Woods was a meteorologist, artist, instructor, author, illustrator, mentor, and friend to multitudes. Don and his little cartoon character, Gusty®, have found a place in our hearts and Oklahoma history.